The Sesderma Salises Foamy Soap-Free Cream is the ideal cleanser for oily, acne-prone, and problematic skins. 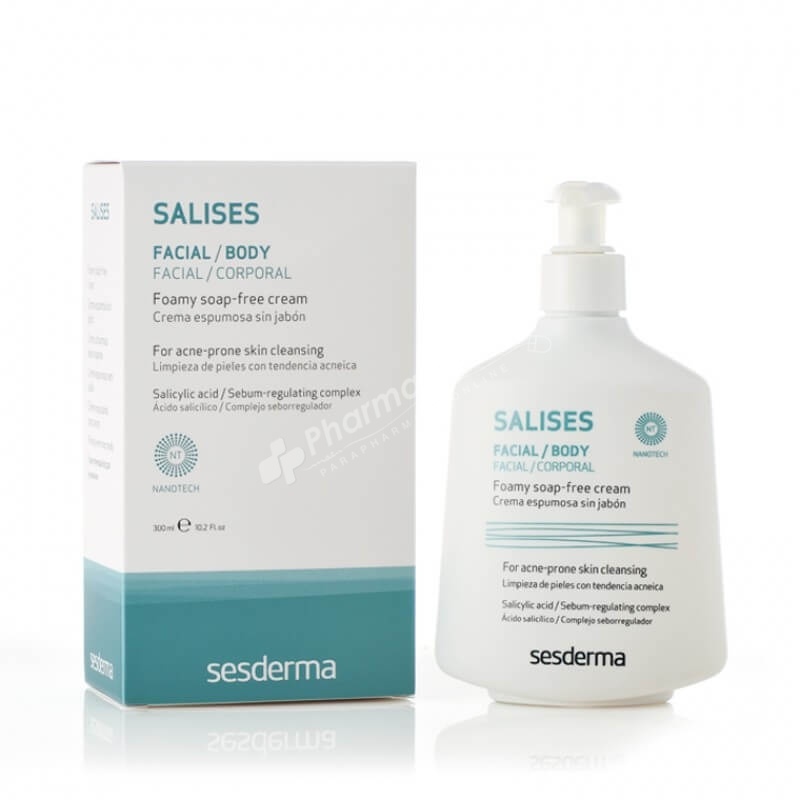 Sesderma Salises Foamy Soap-Free Cream provides a daily facial hygiene. This foamy cream is intended for all skin types, but due to the presence of salicylic acid, in particular for atopic and acne skin. It has astringent action and makes skin becomes matte. It soothes irritations and reduces inflammation. Product besides of content of salicylic acid contains also a complex which regulates secretion of sebum and zinc salts, which reduce the greasiness of the skin and regulate the sebaceous glands. They work disinfecting and bacteriostatic on inflammations, prevent their spread and reduce the swelling and itching. Cream causes peeling of the skin, preventing the accumulation of dirt inside the pores and removing dead cells from the skin surface. It prevents water loss through the skin, stimulates the synthesis of collagen and decreases the signs of aging. Massage into wet skin using gentle circular motions until a creamy foam appears before rinsing with warm water. Can be used once or twice a day. Avoid contact with the eyes. Aqua (Water), Sodium Laureth Sulfate, Cocamidopropyl Betaine, Salicylic Acid, Glycerin, Cocamide Dea, Barbadensis Aloe (Barbadensis Aloe) Gel, Oact (sativa Oats) Extract, Matricaria (Chamomilla recutita) Extract, Sweet tenuiflora (Sweet tenuiflora) Bark Extract , Sodium Chloride, Phenoxyethanol, Peg-7 Glyceryl Cocoate, Hydroxyethilcellulose, Propylene Glycol, Parfum (Fragance), Imidazolidinyl Urea, Methylparaben, Triclosan, formaldehyde, Benzoic Acid, Ethylparaben, Propylparaben, Butylparaben.